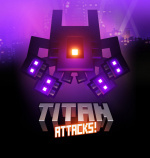 On its official website, British developer Puppy Games declares Titan Attacks as 'the best Space Invaders tribute ever'. Whether you choose to agree with it or not, this simple statement aptly describes what to expect from this homage to Taito's 1978 classic arcade hit. Yes, it's time to jump into a somewhat impractical tank in order to save the Earth from an invading alien army. 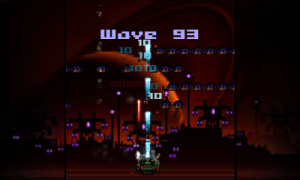 Armed with a cannon and locked into a plane of horizontal movement across the bottom of the screen, your objective is to eradicate all incoming waves of enemies by blasting them into pixel oblivion. The initial wave is all too familiar; a bunch of hapless invaders plod slowly in formation across the sky, begging to be shot to pieces. Additional features soon materialise, however - avoid taking any hits to activate a multiplier that increases with each wave passed unscathed, maxing out at x9; taking damage resets the multiplier back to zero. Growing this multiplier doesn't just boost your score, but also increases the amount of 'bounty money' you gain from each destroyed alien. After each wave a shop becomes available, selling helpful items in exchange for your hard earned cash. Consumable items such as smart bombs and additional shields are available as well as permanent weapon upgrades and additional firepower. Increasing prices (the shopkeeper clearly favours profit over saving the planet) forces a strategy of deciding your preferred upgrade path. Will you aim for a more powerful gun to cut through the tougher, later enemies, or save up for a second side mounted gun? Further progression sees the enemy adopt new attack patterns; spinning, teleporting and swooping low in an attempt to reduce your shield to zero and force a game over. 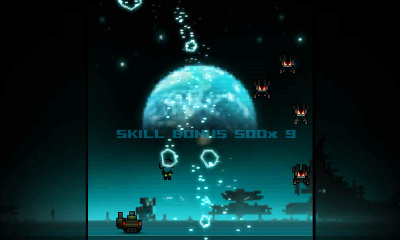 There are a few other gameplay flourishes, such as high flying UFOs that provide random bonuses such as additional points, money or a short-lived burst of additional weaponry. Destroyed aliens might kamikaze spin down to earth instead of exploding, and shooting them in this state gains extra points. Parachuted aliens sometimes choose to eject from their doomed spacecraft; you can catch them to earn extra cash, but allow any to land and incur a penalty. Assessing whether it's worth attempting a catch or forfeiting in order to keep your shield intact becomes a regular decision in later waves. There are a total of a hundred waves to complete, with the backdrop changing after every twenty. Each different battleground represents a location - Earth, the Moon, Mars, Saturn and finally the aliens' home planet of Titan. There's a rather uninspired boss battle at the end of each, plus a few bonus rounds scattered throughout which involve shooting a set number of swiftly moving UFO's for more goodies. Progression is saved in planetary chunks, so you can begin from any completed location or save and quit at any point to pick up exactly where you left off. Complete all waves and everything begins anew from the beginning, only this time it's a little tougher and thankfully all your upgrades remain intact. 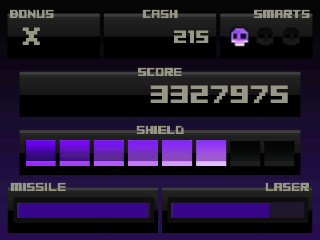 After this point, death is final; there are no more planetary checkpoints, this is purely for high score chasing. There's an online leaderboard to climb for bragging rights, which fast becomes the only real incentive to keep playing. In fact, once you've cleared the game once or twice it becomes apparent there's not an awful lot else to do. In later waves, simply purchasing and using smart bombs allows wave clearance in seconds, plus once you have acquired a decent set of additional firepower most of the challenge is removed. This isn't helped by the ease at which you can refill your shield to maximum in the shop, further decreasing the skill requirements for those with sharp skills. Previous releases of Titan Attacks on rival platforms benefited from HD resolution graphics, meanwhile, bringing the retro-inspired designs to life with vibrant colour. Unfortunately on the lower resolution screen of the Nintendo 3DS this effect is lacking, and the visuals come across as muted and dulled down; there's also no stereoscopic 3D (all action is on the top screen) and some slowdown in busier moments. Considering this is a game that was originally released over 3 years ago on PC, it's a shame to see this latest iteration arrive with no new additions and less overall polish. I love this game on the PS4 and Vita, but have heard there are framerate issues with the 3DS port. Bummer to see it only score a 6, but $10 may be a big high. I was seconds away from buying this and then I read this. To the devs: no 3D on the 3DS is a no no and even without 3D, it's still dropping frames? Release an update addressing both the 3D and the frame rate issue and you got my money. Otherwise, nope and dammit, I wanted this. Seconded: no 3D, no buy. I played this on PlayStation, which thankfully was one of the free games for the Plus promotion a few months back. I think it took me between 30 minutes and an hour to complete the game along with all trophies. Most levels you can finish within seconds. Such a high price tag for a short game. I wish Nintendo would do some quality control on titles like this and Myst "3D". It should be a standard rule that a game released that runs native on the 3DS hardware (as in no Virtual Console port, or DSi download) should make use of the 3D effect the system provides. Oh cool, its like SI. I had much fun with space invaders extreme 1 and 2 on the DS. 3D really wouldn't benefit this game. At all. For that matter, requiring every game to be 3D would be a little like requiring every game to use the stylus "because it's there." That usually does not lead to good game design. That's why we ended up with cumbersome games where you had to flick the Wii Remote around to make a character jump. I haven't seen any evidence of slow down (new 3ds xl is my weapon of choice) and am finding it to be enjoyable. Galaga was my favourite arcade game back in the 80's and I have the version on the "dimensions" card. I think this game compares favourably with Galaga and I am enjoying the strategy aspect of what to spend the money on! I personally think the reviewer was a bit harsh both in words and score! @Quorthon Exactly. I really hated how because of the wiimote one was forced to use it in some games. Example would be the monkey ball wii series... the challenge comes for the fact you struggle to properly move around. I really haven't played (yet) a game that utilizes for something worthy other than looks. 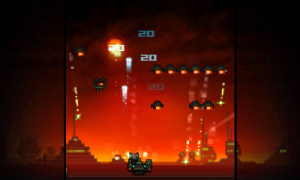 Space Invaders Extreme 1 & 2 on the DS are gems. I'd rather get this title on Steam for a lot less. No 3D, no purchase? This is one time I will agree with Quorthon. What the point to having 3D? There is no reason to have, not a single one. I'm guessing you 2 was one of the people that wasn't mad at Nintendo for taking out Gamecube controls in Metroid Prime Trilogy. Maybe it's because I played it right after Resogun, Velocity 2X, Stardust Delta and Geometry Wars 3, but I couldn't get into this game. Nothing about it seemed all that bad, just wasn't the right speed for me at the time. I'd say @moomootown got it right on the money here. It doesn't look like a very good port. I'll hold out for a possible Wii U version. "It's a tougher challenge, and arguably trumps even the mighty Space Invaders. Ooh, controversial…"
Would somebody really call that controversial? Would somebody honestly argue that the original Space Invaders'd be better than Galaga? I think it's a pretty universally accepted view to call Galaga a major improvement over SI in every single way. I just bought this over the weekend, as someone who ONLY plays games on the 3DS in 3D I actually never realized it wasn't in 3D until reading this review. It simply wasn't a concern to me. I find it a rather fun little time waster, however. Oh, it's $10? I love this game, but no. Especially on that 3DS screen. That's too bad. I would have looked twice if it was in 3D, but that's not even there. Sure, it doesn't need it, but It would be fun. Also, it could help separate the enemies and shots from the background which is helpful for clarity. Now, something like Revenge of the Titans is a much bigger experience. Picked it up but only because it was on discount. It's a limited but fun enough game. It did freeze on me once though and the manual is lacking in info and I needed to go online to figure out what the recharge upgrade did. I've nearly finished the game and I don't recall any slowdown. Maybe it's because I'm using the N3DS. Agreed. No 3D, no buy. What kills me is when people who don't even like 3D or get headaches from it (or still think it can be called a "gimmick") try to make a point about why they think 3D isn't necessary. Clearly it's not done for those people, anyway, so they're the last ones who should be commenting on that aspect. It's done for everyone else who can appreciate the huge amount of impressiveness and immersiveness that actual depth adds to the experience. I've yet to find a game that did even a halfway decent job of adding 3D that didn't benefit from it greatly. Just because you can get away with not adding it, doesn't mean you should. @Chaoz No 3D, no purchase? Same here, although I'm actually considering it even without 3D right now, since it's only $1... not sure, though. @Mommar I just bought this over the weekend, as someone who ONLY plays games on the 3DS in 3D I actually never realized it wasn't in 3D until reading this review. Yikes, it sounds like something's wrong with one of your eyes! You should get 'em checked out right away. Let's see, my problem with this is why people would skip a game just because 'no 3D'. You mention that 3D adds a 'depth of experience', but is it such an important factor to skip a whole game? Sure, the console main 'feature' is 3D, but so far it's just for looks. I haven't seen a game that forcefully uses 3D for gameplay stuff, and IMO, skipping the game entirely for such thing seems silly. It seems that adding 3D capabilities demands some power of the 3DS CPU, and this implies it limits the scope of the game. IMO, I would rather have the complete intended game, than a version that was stripped down to get the 3D in. Thought, it seems it's possible to release the game that knows when it's running on the New 3DS so it can use 3D, since IIRC, Hyrule Warriors does this. Dunno how it works, or if it implies more work on the programming/development process. I think you mixed up the two names in your reply. Your opinion isn't going to be the same as anyone who doesn't view the 3D as a "gimmick" (most people who leave it on), and never gets headaches from it. The 3D uses the same amount of power from the CPU as the difference between 30/60 frames per second (all it's doing is adding a second view for your other eye), and many games only slow down when you turn it on. There's no need to strip a game down at all for 3D, it just takes a little more effort from the developer. There's no game that literally requires it (except in Japan), but it makes many games much easier than without, by making it so much easier to tell distance, especially for 3D platformers. There's a lot of games that would be a lot worse without it, like CRUSH3D for example. It also makes every aspect of the visuals more exciting. It's not important enough for me to skip a game that's really high quality otherwise, but it's enough to not bother with any game I'm not sure about. @Geno-Beatdown Yeah, sorry about that, seems like I mixed the replies. And I know, an opinion is an opinion and it may differ from other peoples opinion. Since I don't use the 3D, I replied to you as you seem to be a 3D user and I would like to read your input on the whole 'no 3d, no buy' topic. And I see, I thought it was more CPU intensive or something, like, why wouldn't the pokemon games use 3D on the overworld or Hyrule Warrios disabling it on the old 3DS.. Interesting, I suppose it makes sense that a 3D view makes it easier to calculate movements since one 'sees' more, so it should make the gameplay go smoother. But yes, I understand that the coat of 3D provides some nice visuals, and it might make a game one has second thoughts more appealing if it has 3D. I'm mainly going because I've seen recently people comment that they just instantly say 'no 3D, no buy', despite the game being considered a good one. Just out of curiosity, what's that game(s) in Japan that requires the 3D? You don't use the 3D at all? Mainly for the headache reason? You've seen people say "no 3D, no buy" on games that score higher? Usually games that are good enough to get an 8 on here, are good enough for me to overlook no 3D, but it still bothers me because it feels like an in-your-face (literally, cuz there's no depth) disappointment when switching from other games on the 3DS. I don't know about the 3DS version of Hyrule Warriors, but I just found out about how the Pokemon games don't use it on the overworld (wasn't sure if I wanted to try those ones, so I asked about the 3D), and I can't imagine why. They're totally inconsistant about 3D in Pokemon games. Pokemon Rumble World has that screen where you talk to the king, which is the only screen in the entire game completely in 2D. It's very strange and jarring when suddenly the same Mii characters that are in 3D in the plaza are all smushed flat, considering that it would've taken less time to make that single screen 3D than any of the things that already are. The Japanese game is one made for 3D vision training, mainly for people that have trouble with it and small children. Yes, the 7+ age thing is all nonsense, and it's completely harmless for their eyesight. That was only done to quiet the complaints of paranoid parents. This game I'm talking about is specifically made to appeal to very young children, and says for Ages 3+. My issue with the whole 'no 3D, no buy' came from the recently released 7th Dragon game, which has no 3D. The game got a 9 here (and I've been playing it myself and it's pretty nice) yet they were the 'no 3D, no buy' or 'no 3D, so I'll wait till the price drops' comments. I pondered about the performance issues because that game sometimes has framerate issues (but they use frame skipping, so you don't feel the slowdown), so I thought the no 3D was because the system couldn't handle it and wondered why would someone skip a game that could be enjoyable just because of the 'no 3D'. As for the inconsistency, I dunno. It seems either the developers can't decide where to use the 3D or indeed that the game would suffer slowdown (but after all, I dunno how the 3D processing of the 3DS really works, as for the wii u, things like Pokken drops to 30FPS in multiplayer because the console has to render the objects from the gamepad viewpoint on top of what's already being rendered on the TV). @Gridatttack Only the Pokemon games mix 2D and 3D like that, and it's not for any logical reason. All the 2D parts are in the most basic areas that definitely don't have any reason for performance concerns. I'll be getting 7th Dragon because it's good enough that I wouldn't want to miss it, but 3D or not doesn't affect when I get games, because I always wait until they all go on sale for a lot less before buying them. That's a shame, and I definitely feel bad for you, because I know how much that would bother me. I have a Virtual Boy, and more people have played that for over twenty minutes with no problem (twice as many people with zero headaches, after I helped adjust it specifically for them), than people who've tried my 3DS (about 20 people with 3 that said they got a headache). I'm guessing you've tried it with the 3D set at lower levels, too, right? Have you tried that on the New model? With regards to 3D, I'll throw in my reasoning as to why I feel it should be necessary for any game released on the 3DS. I use a New 3DS XL, though the same issue would apply with the standard 3DS XL. If you play a game on one of those models, with 3D turned off, the screen resolution combined with a lower DPI shows serious flaws in the picture quality. Often times when I run a game in 2D there is a bit of a struggle to delineate where some objects start and others end (if not a struggle, definitely a distraction). For me, it's a problem especially for games which are multi-platform as I feel I shouldn't waste my time playing/buying a game which does not utilize 3D on the 3DS. I find that the 3D setting definitely sharpens the borders of objects just by adding the depth factor. Overall, it improves the picture quality from that which 2D mode offers. I also have a standard size 3DS. Since the DPI on that is tighter, it doesn't look as bad to view a flat image, but it's still noticeably crisper in 3D. Some games utilize the 3D perfectly, like Kirby Robobot for instance. There are times where having depth will actually give you an advantage. Considering the console is called 3DS, the 3D and 2D modes should be mandatory. As someone mentioned earlier, there's no CPU hit for 2D if 3D is disabled. 3D will suffer only when it is turned on. Perfect example (sadly) is Hyrule Warriors Legends. The game runs smooth in 2D, sluggish in 3D, but I still prefer 3D. @Deadstanley That's the problem with 3D. Seems like having 3D hinders what the game could offer if 3D would be mandatory, and poses a concern like quorthon mentioned. It looks like some games have it turned off because the game would lag too severely.